If you just adopted, it is likely your dog is already current on all vaccinations required by the City of Houston’s public dog parks. Organizations like the Animal Humane Society build the cost of vaccines for diseases like Bordetella, Distemper, and Rabies into their adoption fee. Make sure to update the Rabies tag on your dog’s collar whenever you do routine check ups at your vet. Additionally, Houston authorities require that you register your dog; this license is also displayed on a collar tag that you receive in the mail. Attach both tags to a leather or nylon collar before spending time at a dog park. Both the Rabies & Registration tags can be extremely helpful if your dog is ever involved in an incident at the dog park. And if your dog is ever bit or the recipient of aggressive behavior, don’t hesitate to ask the other dog’s owner about the status of their animal’s vaccine history. It’s no secret that Houston has mosquitos… and unfortunately, ticks have become an increasing worry to US officials because of the variety of diseases they can transmit. The good news is that it’s easy to protect yourself and your pets from having to deal with these pesky parasites. Our Veterinarians can help you choose the best preventive option for your family; choices range from shampoos, to prescription treatments, to Insect Growth Regulators that you spray on your yard. Check out our FAQ page to read more about the best way to prevent fleas/ticks at home. Be sure to mention to your vet that you’d like to let your dog socialize at a public park! They can discuss options to ensure flea & tick prevention for when the environment is outside of your control. And don’t forget about protecting yourself. If you’re hanging out while your pet is playing, chances are high that you could be bit. Use insect repellent diligently! This might seem obvious, but having drinking water is a necessary component to making sure your dog stays healthy and happy on their trip to the bark park. There are seemingly endless options for collapsible water bowls; some even hook onto your dog’s leash for easy carrying. Don’t count on a water fountain being at the park… bring your own bottle of water (a big one!) and share it between yourself and your dog’s bowl. And whatever you do, don’t let your dog drink standing water at the park. If your park has a place for dogs to swim or splash, make sure to ask your Veterinarian about a vaccination for Leptospirosis, a dangerous bacteria that can affect the liver and kidneys. Also, bring bags with you to pick up any poop! Before coming to the dog park for the first time, see how your dog acts with one other dog around. Try to introduce them to a friend or family member’s pet that you already know is sociable. Does your dog respond to your commands when they’re off leash? You can go to the park at non-peak hours to practice voice commands. 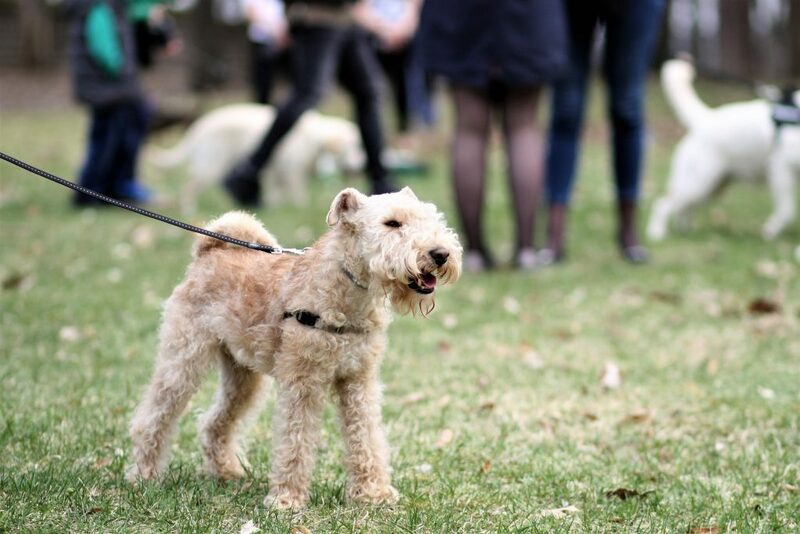 Once you feel confident in your dog’s off leash behavior, try the park with others around! You can keep your dog on the leash in the park, as long as you’re holding on to it. When you feel ready, let them off leash! If your dog is running around the park, make sure you’re cognizant of their activities. You don’t have to hover, but be aware. Ultimately, dog parks are an excellent way for your dog to exercise and engage socially. Houston has many parks across the city, and they are all free for your pet to run and play. Call us today if you would like to know more about any of the above vaccinations! You can also review the City’s full list of rules for visiting any of the dog parks.